Coffee is the world's favourite drink, the most important commercial crop-plant, and the second most valuable international commodity after oil. Worldwide there are about 20 million coffee farming families; around 100 million people depend on coffee for their livelihoods. Its export value alone is immense (US $ 15.4 billion in 2009/10) and as such it plays a crucial role in the economies of several tropical countries. Coffee is made from the roasted seeds of the genus Coffea, and is brought from plant to cup via a complex process. The glossy red fruits are picked, the fleshy outer part of the berry removed and then their pale-coloured seeds (beans) are sent to mills to remove the hard outer layer encasing the seeds. 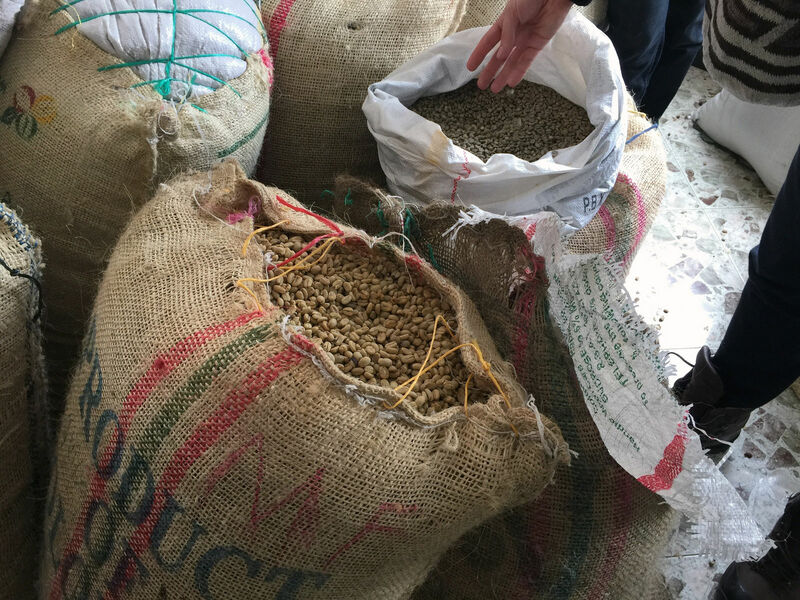 At this stage the beans are either exported, or they are blended with others from the region before exportation. The complicated process of roasting usually occurs in the country where the beverage is consumed. 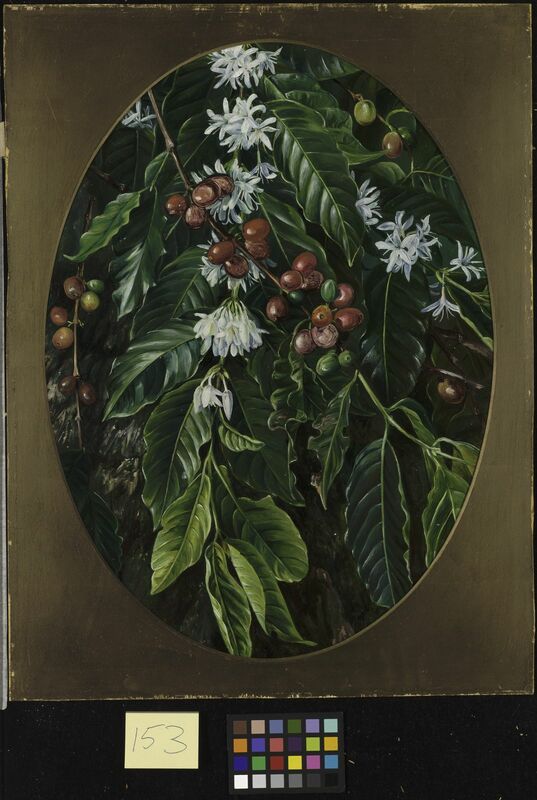 Coffea arabica is native to northeast Tropical Africa (Southern Ethiopia, South Sudan (Boma Plateau); and possibly East Tropical Africa (Kenya, Mt Marsabit). It is sometimes naturalised in tropical areas. 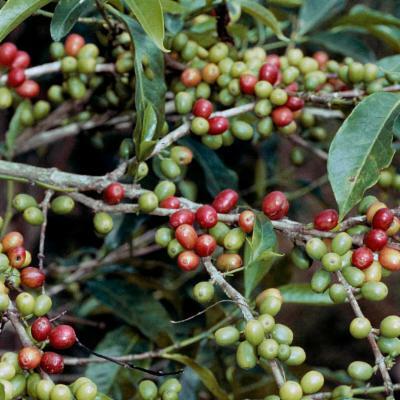 Arabica coffee grows at 950 m to 1,950 m above sea level. In total, there are 125 coffee species, which occur naturally in Africa, the Indian Ocean Islands, (Madagascar, Comoros, and the Mascarenes), southern Asia, south east Asia and Australia. Arabica and Robusta coffee are the main beverage species, with a small percentage of Liberica coffee (Coffea liberica ) grown for commercial purposes. Other species in East Africa and Madagascar are sometimes used locally to make coffee on a very small scale. Overview: A small tree, 2 to 8 m tall, with characteristic horizontal branching, although in plantations it is usually pruned to take the form of a small shrub. Its leaves are evergreen and usually shiny. Flowers: The flowers are hermaphroditic and sweet-scented, the corolla white, tubular, normally with 5 lobes. Fruits: The fruits are usually red but sometimes yellow or purple at maturity. The outer layer is soft, edible and sweet-tasting, containing two or sometimes one 'seed' — actually a seed encased in a hard, almost crispy outer layer which together forms a structure known as a pyrene; this outer layer is removed by milling. Seeds: The seed itself is pale fawn or brown (dark brown only after roasting) and has a characteristic groove on its inner surface, which curls round inside the seed. 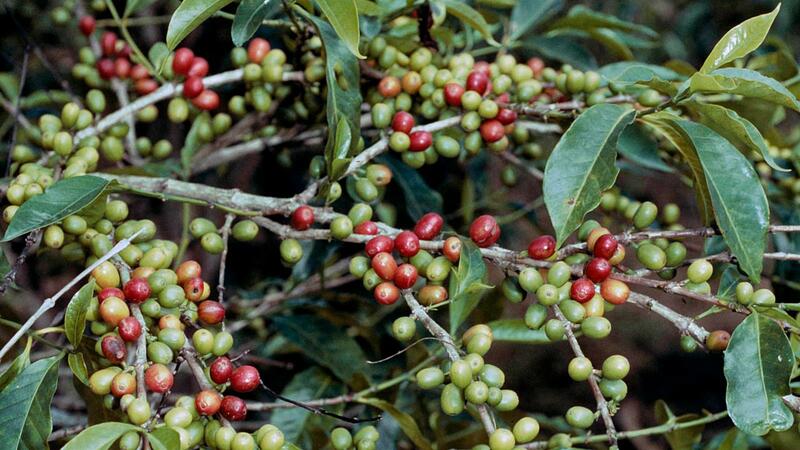 Arabica coffee is a hybrid species, formed by the hybridization of Coffea eugenioides and Coffea canephora . It is one of the only species in the genus Coffea that is self-fertile (autogamous), a single plant being able to produce fertile seed from its own pollen. Based on its extent of occurrence alone, Arabica coffee falls within the Vulnerable extinction risk category. However, a rating of Endangered is more likely, owing to ongoing deforestation in Ethiopia and elsewhere, and the threats posed by climate change. Arabica is a climate-sensitive species, being found only in humid, montane forests at 950-1950 m. The montane forests of south-western Ethiopia are by far the most important area in terms of natural distribution and genetic diversity. Cultivated Arabica is under threat because of a low-level of genetic diversity within the crop cultivars, leaving plantations vulnerable to pests, diseases and climate change. These problems are compounded for both wild populations and crops because coffee seeds cannot yet be stored successfully in conventional seed banks (in low temperature, low moisture environments). In vitro germplasm collections, cryopreservation and living collections are possible alternatives but they are expensive and time-consuming to maintain. Kew produces conservation assessments for coffee species as part of its important coffee research programme. Coffee plantations can be managed to promote biodiversity, with many plantations now being certified by fair-trade and forest alliance organisations. In particular, shade coffee can be planted with forest trees, to promote wildlife and particularly bird species. Coffee cultivation may have started in the sixth century in Yemen, its use being for spiritual purposes. Coffee became a popular drink in Europe from the seventeenth century onwards, being imported from plantations established first by the Dutch in Ceylon (now Sri Lanka), Java, and later from plantations in Brazil and the West Indies established in the eighteenth century. Much of the world's Arabica coffee is produced in Latin America. The stimulating effects of coffee are largely due to the alkaloid caffeine contained in the seeds. As well as a beverage, coffee is used for flavouring foods and confectionery. The beans are also a commercial source of caffeine, a by-product of making de-caffeinated coffee. Caffeine is added to soft drinks and medicines as a stimulant and diuretic. Roasted and ground coffee is a constituent of traditional medicines in South-East Asia to alleviate stomach ache and diarrhoea, to increase blood pressure, and as a diuretic. In some countries coffee leaves are used to make a hot drink, like tea. Coffee wood, from the main trunk, is used locally in construction. David Livingstone, the nineteenth century explorer and missionary, reported seeing coffee trees being used to make huts in his travels in southern Africa. The timber is straight, dense, strong and partially resistant to termites. The wood is also used for furniture and as fuel wood. Originally from the high altitude, humid forests of Ethiopia and South Sudan, where it still grows wild, Arabica coffee ( Coffea arabica ) is considered to produce the finest coffee beans. Most instant coffee is made from a mixture of Arabica and Robusta ( Coffea canephora ), the latter having a less delicate flavour and aroma and more caffeine. Generally, Arabica is grown in upland plantations and Robusta in lowland plantations. Kew's Millennium Seed Bank Partnership aims to save plant life worldwide, focusing on plants under threat and those of most use in the future. Seeds are dried, packaged and stored at a sub-zero temperature in our seed bank vault. Although recent research shows that there are many positive health benefits from consumption in moderation, much research is being undertaken to investigate the numerous compounds found in coffee and how these affect quality and human health. Alt. 200 - 2600 m.
Cultivada en Colombia; Alt. 200 - 2600 m.; Amazonia, Andes, Guayana y Serranía de La Macarena, Sierra Nevada de Santa Marta. Bush or tree 2–7 m. tall; young branches glabrous, covered with light brown shiny bark. Leaf-blades elliptic to broadly elliptic or oblong-elliptic (or lanceolate or round in some cultivated forms), 7–18 cm. long, 3–7.5 cm. wide, distinctly acuminate at apex, acute to obtuse at base, thinly coriaceous to coriaceous, with 7–10 pairs of main lateral nerves, shiny above, margin sometimes undulate; domatia rather inconspicuous, glabrous, occasionally absent from some leaves; stipules triangular, 4–8 mm. long, acute, usually exceeded by a mucro. Flowers (4–)5(–6)-merous, 2–20 per axil, borne in 1–3(–15) fascicles; peduncle 0.5–2(–3) mm. long in flower (2–4 mm. long in fruit); pedicels 1–2(–3) mm. long (calyces usually well clear of surrounding bracteole); bracteoles frequently with subfoliaceous lobes up to 6 mm. long. Calyx-tube 1–2 mm. long; limb reduced to a rim or sometimes irregularly toothed; teeth up to 1(–2) mm. long. Corolla-tube (0.5–)0.9–1.1 cm. long, 2–3 mm. wide at throat; lobes oblong, 0.9–1.6 cm. long, (2–)4–6 mm. wide, rounded. Fruit red (yellow or purple in cultivated forms), oblong-ellipsoid or sometimes ± subglobose, 1–2 cm. long, 0.9–1.1 cm. wide; pedicel lengthening to 4–8 mm. Seeds fawn or greenish fawn, 9–1.2(–1.5) cm. long, 6–7 mm. wide. Andaman Is., Ascension, Bangladesh, Belize, Bermuda, Bismarck Archipelago, Bolivia, Borneo, Brazil North, Brazil South, Brazil Southeast, Brazil West-Central, Central American Pac, China South-Central, China Southeast, Colombia, Congo, Cook Is., Costa Rica, Cuba, Dominican Republic, Easter Is., Ecuador, El Salvador, Fiji, Gabon, Galápagos, Guatemala, Guinea-Bissau, Gulf of Guinea Is., Hainan, Haiti, Honduras, Jamaica, Leeward Is., Lesser Sunda Is., Malawi, Marquesas, Mexico Central, Mexico Southeast, Mexico Southwest, Myanmar, New Caledonia, Nicaragua, Norfolk Is., Ogasawara-shoto, Panamá, Peru, Puerto Rico, Rwanda, Society Is., St.Helena, Taiwan, Trinidad-Tobago, Tubuai Is., Venezuela, Windward Is. Davis, A.P., Govaerts, R., Bridson, D.M. & Stoffelen, P. (2006). 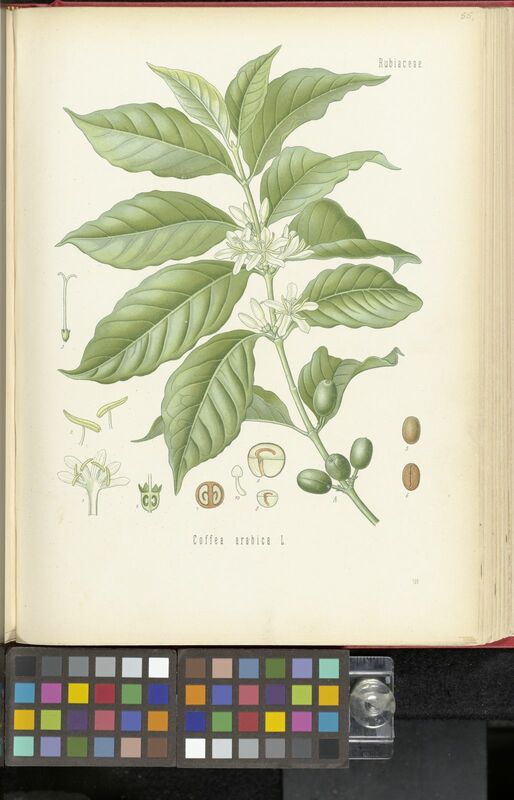 An annotated taxonomic conspectus of the genus Coffea (Rubiaceae) Botanical Journal of the Linnean Society 152: 465-512. Delprete, P.G., Smith, L.B. & Klein, R.M. (2004). Flora Ilustrada Catarinense 1: 1-344. Herbário "Barbosa Rodrigues", Atají, Brasil. Davis, A. P., Gole, T. W., Baena, S. & Moat, J. (2012). The impact of climate change on indigenous Arabica coffee ( Coffea arabica): predicting future trends and identifying priorities. PLOS ONE 7: e47981. Davis, A. P., Tosh, J., Ruch, N. & Fay, M. F. (2011). 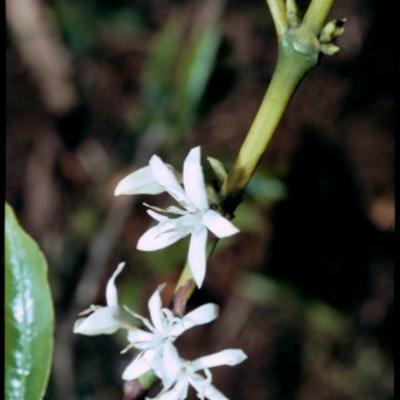 Growing coffee: Psilanthus (Rubiaceae) subsumed on the basis of plastid and nuclear DNA sequences; implications for the size, morphology, distribution and evolutionary history of Coffea. Botanical Journal of the Linnean Society 167: 357–377. Davis, A. P. & Rakotonsalo, F. (2008). 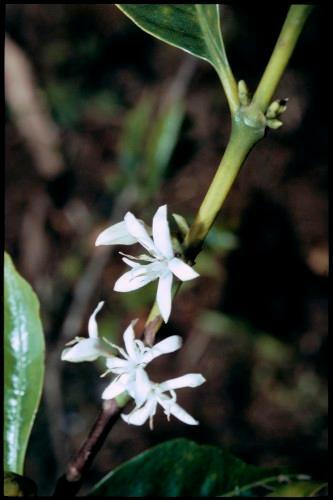 A taxonomic revision of the baracoffea alliance: nine remarkable Coffea species from western Madagascar. Botanical Journal of the Linnean Society 158: 355–390. Davis, A. P., Chester, M., Maurin, O., & Fay, M. F. (2007). 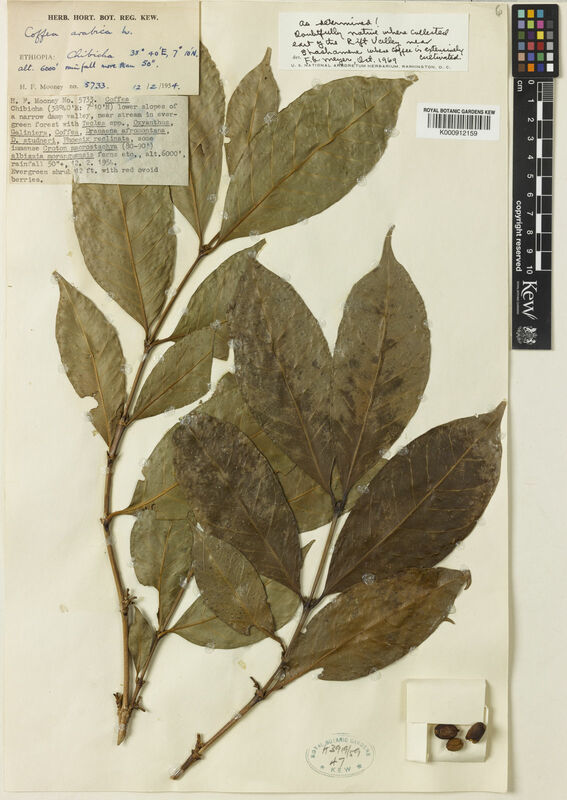 Searching for the relatives of Coffea (Rubiaceae, Ixoroideae): the circumscription and phylogeny of Coffeeae based on plastid sequence data and morphology. American Journal of Botany 94: 313–329. Maurin, O, Davis, A.P., Chester, M., Mvungi, E.F., Jaufeerally-Fakim, Y & Fay, M.F. (2007). Towards a phylogeny for Coffea (Rubiaceae): identifying well-supported lineages based on nuclear and plastid DNA sequences. Annals of Botany 100: 1565–1583. Davis, A. P., Govaerts, R., Bridson, D. M. & Stoffelen, P. (2006). An annotated taxonomic conspectus of the genus Coffea (Rubiaceae). Botanical Journal of the Linnean Society 152: 465–512. Pendergrast, M. (2001). Uncommon Grounds: The history of coffee and how it transformed our world. Texere, New York. van der Vossen, H. A. M. & Wessel, M. (eds) (2000). Plant Resources of South-East Asia No. 16. Stimulants. Backhuys, Leiden. Burkill, H. M. (1997). The Useful Plants of West Tropical Africa Vol. 4. Royal Botanic Gardens, Kew. Wrigley, G. (1988). Coffee. Longman, Harlow. Livingstone, D. (1858). Missionary Travels and Researches in South Africa. London. Chev. Caf. du Globe 2: tt. 17-24: 3: 196 (q.v. for vars.). Bridson, Troupin & Verdc. in Fl. Rwanda 3: 154, fig. 47.1 (1985). Keay in Flora of West Tropical Africa, ed. 2, 2: 156 (1963). F. White, Forest Flora of Northern Rhodesia p. 405 (1962). Haarer, ModernCoffee. Prod: 13 (1962). Dale & Greenway, Kenya Trees and Shrubs p. 436 (1961). Cramer, Rev. Lit. Coff. Res. Indonesia: 89 (1957). F. W. Andr., The Flowering Plants of the Anglo-Egyptian Sudan: 2: 432 (1952). A. Chev., Caféiers du Globe 3: 442 (1949). A.S. Thomas in Emp. Journ. Exp. Agric. 10: 207–212 (1942). Lebrun in Mém. Inst. Roy. Col. Belge, Sect. Sci. Nat. Méd. Mém. 8°, 11(3): 114 (1941). A. Chev., Caféiers du Globe 1: 71 (1929). Cheney, Coffee, Monogr. Econ. Sp. : 48, t. 13–18 (1925). De Wild. in Ann. Jard. Buitenz., suppl. 3, 1: 360 (1910). Froehner in A. Engler, Botanische Jahrbücher für Systematik, Pflanzengeschichte und Pflanzengeographie 25: 261 (1898). K. Schum in Die Pflanzenwelt Ost-Afrikas und der Nachbargebiete, Theile B: 246 & C: 387 (1895). Hiern in Flora of Tropical Africa 3: 180 (1877), pro parte. A. Rich., Tent. Fl. Abyss. 1: 349 (1848). DC., Prodr. 4: 499 (1830). Sims in Bot. Mag. 32, t. 1303 (1810). L., Sp. Pl. : 172 (1753).